Columbia/Duesseldorf, January 17, 2015 – The well-balanced fun and educational elements of this family vacation program aim to offer families a week to remember forever. The goal of Kids Sea Camp’s is to make children become enthusiastic about joining their parents’ love for the ocean and to learn fun things. The program is designed to promote an awareness of marine related issues, with a strong focus on conservation. The teaching includes both education in a classroom environment as well as hands-on programs that teach age appropriate curriculum. 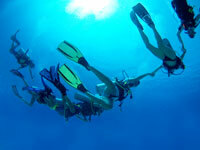 Subject to the age of the child, they have a choice of joining any of these programs: SASY (snorkeling), SEAL TEAM (the first stage of scuba diving, experienced in an enclosed shallow environment), Junior Open Water Certification (scuba diving training for kids 10 and up) and the Teen Ocean Discovery program (advanced programs for certified divers, working on continued education and certifications). In July 2015, Kid’s Sea Camp will host one event each in Yap, Micronesia and in Palau, perfectly tying in with the European summer vacations. The one week program includes diving and snorkeling, dinner events such as beach BBQs and lectures and presentations on the ocean and its inhabitants. 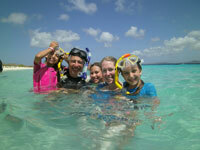 Other locations include Bonaire. St. Lucia, Grand Cayman, Honduras and Fiji.